Botulinum toxin is a purified bacterial substance that blocks muscle nerve signals. The dentist can safely inject botulinum toxin to weaken facial muscle and diminish unwanted wrinkles and frown lines that appear across the forehead and at the corners of the eyes (crow’s feet). The Botox anti-wrinkle treatment can smooth out age-related wrinkles such as crows feet, frown lines or lines on the forehead. It works in a different way than the injected gels and the effects last between 3 – 5 months. BOTOX® Cosmetic is a simple, non-surgical, physician-administered treatment that can temporarily smooth moderate to severe frown lines between the brows in people from 18 to 65 years of age. It is the only treatment of its type approved by the Food and Drug Administration (FDA). One 10-minute treatment, a few tiny injections and within days there’s a noticeable improvement in those persistent lines between the brows, which can last up to 4 months. Results may vary. BOTOX® Cosmetic is a purified protein produced by the Clostridium botulinum bacterium, which reduces the activity of the muscles that cause those frown lines between the brows to form over time. A million people have been treated with BOTOX® Cosmetic since FDA approval in 2002. Not just models and movie stars, but people from all types of professions. 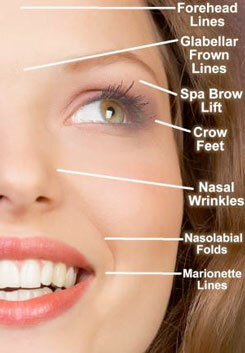 BOTOX® Cosmetic can smooth moderate to severe frown lines between your brows for up to 4 months. Visit the BOTOX® website for more information.